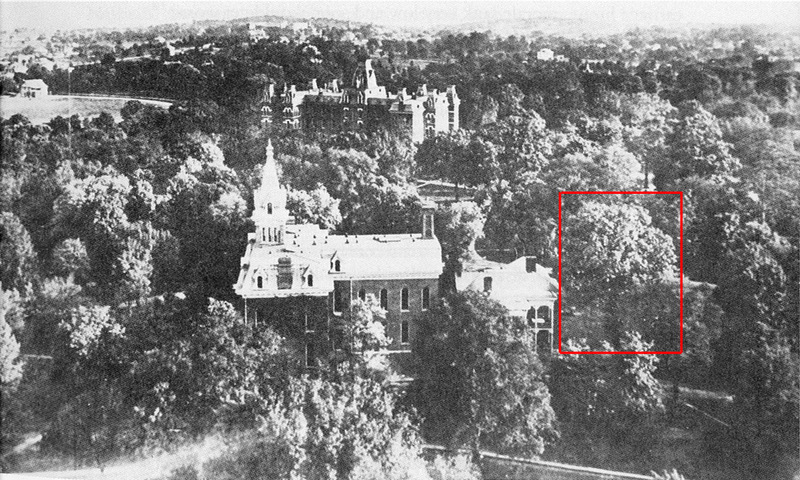 View from the tower of Kirkland Hall sometime between about 1890 and 1920. In the foreground Benson Science Hall is on the left and Old Central is on the right. Wesley Hall is in the distance. The ancient bur oak is just to the right of Old Central. Identification remarks: Vanderbilt Register 10 (2):5 (Sep. 15, 1989) states that the tree was a bur oak. "Vanderbilt University Special Collections and University Archives photo in Gone with the Ivy: A Biography of Vanderbilt University by Paul Conkin, p. 69." If possible, link to the stable URL for this page. McDonald, Susan, 1989. Vanderbilt Register 10 (2):5 (Sep. 15, 1989).. Vanderbilt University, Nashville, TN, US.